Make coffee breaks even better at your office by purchasing a Keurig Coffee Maker from Hallmark Office Furniture. The Keurig single cup brewing system is perfect for any workplace. Keurig isn’t just about great tasting coffee, it’s about how you brew it – simple, fast and no mess to clean up! With over 200 varieties of coffee, tea, hot cocoa or iced beverages, there’s always something for everybody. Keurig’s fleet of workplace brewers means they are sure to have one with the features that fit your needs perfectly. From large corporate spaces to smaller businesses, hotel rooms to waiting rooms, there’s a Keurig brewer that will enhance your workplace and please everyone who uses it. 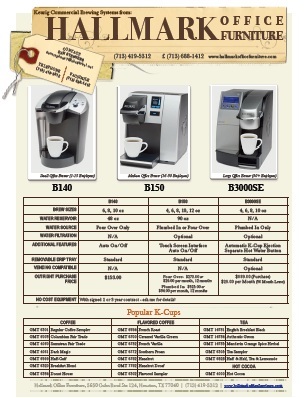 View Hallmark’s flyer for Keurig Coffee Makers! This article was posted on Thursday, April 21st, 2011 at 2:52 pm	and is filed under Specials.